The headline says it all. Last night, 'The Big Sick' took home the Best Comedy Award at the 23rd annual Critics Choice Award. 'I'd like to thank Judd, and Mike, and Barry, all the white men that allowed us to stand here today,' started Kumail, who accepted the award along with Emily V. Gordon. Because what's an acceptance speech for Best Comedy without some sardonic humor? This year's nominees for Best Comedy were a truly exceptional bunch, with all ranking 89% or higher on Rotten Tomatoes, and setting multiple milestones in cinema. 'Lady Bird' is A24's highest grossing film, 'I, Tonya' is the first big breakout film for new distributor, NEON, and 'Girls Trip' is the first film that to hit $100 million BO that was written, produced, directed and starring black people. 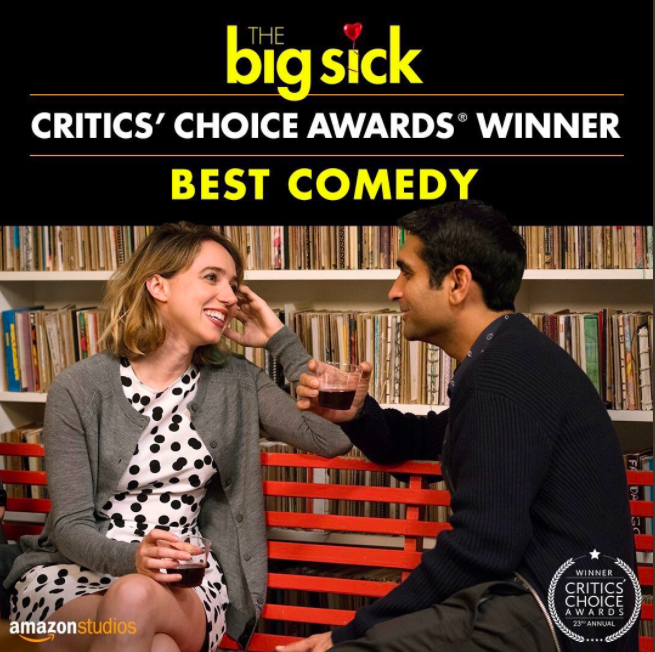 As for 'The Big Sick', it was Amazon's highest grossing film of the year. But beyond numbers, many audiences have connected with the films honest and diverse representation. FilmNation came on as the financier, one of the executive producers and sales agent for the film. It was the highest sale at Sundance and still is in release across the globe. We're incredibly lucky to be a part of this ride and can't be more excited that Kumail Nanjiani and Emily V. Gordon are getting the recognize they so deserve for crafting such a heartfelt and, well, funny, comedy. Congratulations!